The Kenyan retail sector is becoming increasingly competitive and Nairobi-based grocery retailer, Naivas Supermarkets, is emerging as a major player in the market. The family-owned retail chain inaugurated a 3 250m² property in the capital’s Ciata City Mall in July 2017, followed by a new branch in Utawala and another at a location in Kericho in November 2017. To date, Naivas Supermarkets has opened 41 outlets in Kenya, with more stores being planned in the near future. The retail market has seen great challenges, more so within the last two years, but all is being done to ensure consistency and that expansion is well within limit not to strain operating capital. Naivas’ recent expansion and plans for future growth signal a positive development for the sector. 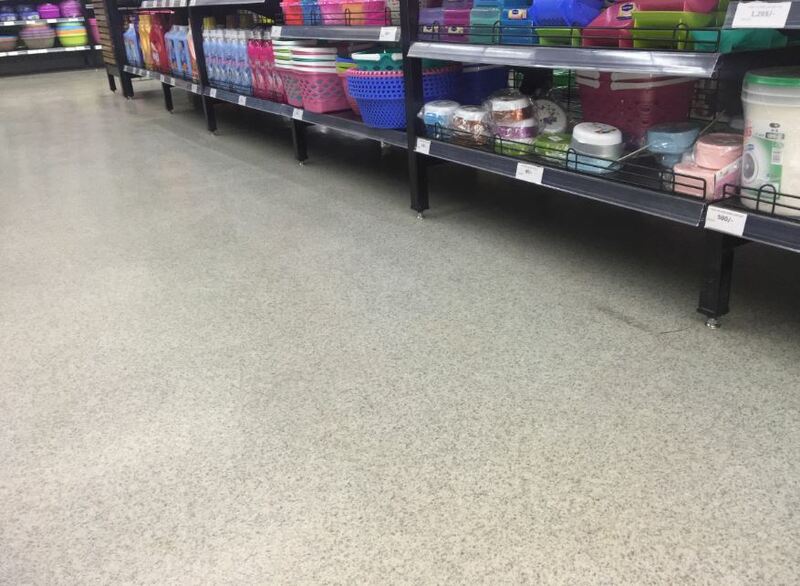 The full flooring fit out for the latest store openings were supplied by Flowcrete Africa, totalling over 15 000m² of resinous flooring material and screed material installed across three stores. The stores yet to open will also make use of the company’s flooring solutions. The new store in Ciata Mall includes an in-store bakery, dairy, meat counter, hot food and pizza oven. The designers wanted to create an upmarket retail experience and needed a floor that would tie into the new store’s visual identity. The floor also had to be robust and have an easy-to-clean surface to withstand heavy foot and trolley traffic, food and drink spillages, inevitable scuffs and scrapes, as well as frequent cleaning. To meet these performance and aesthetic requirements, the flooring build up started with 3 000m² of Isocrete K-Screed, creating a strong screed layer on which to apply the floor finishes. This semi-dry cementitious screed incorporates a proprietary additive to produce an early drying, high strength screed. A decorative epoxy for customer facing areas and a hygienic polyurethane for back of house processing spaces were then installed. To match the store’s interior design scheme, 2 500m² of Peran STB was used throughout the shop. This decorative and durable epoxy resin floor coating is made using colour-stable quartz granules sealed within a clear resin binder. 500m² of the antimicrobial enhanced, polyurethane system Flowfresh RT was installed in Naivas’ on-site bakery. This HACCP International certified finish was chosen thanks to its ability to provide an ultra-hygienic floor that is able to withstand the challenges of a bakery. The entire flooring project was completed in only three weeks, delivering a high performance, fully optimised floor area well in advance of the supermarket’s opening. For more information, contact Flowcrete on Tel: +27 (31) 461 3411 or via www.flowcretesa.co.za.